Eagle set out on the path alone. heart of the Creek Nation, in Oklahoma Territory, to a Muscogee Creek father and Pawnee/Wichita mother. graduating with a fine arts degree in 1932. OSCAR JACOBSON AND THE "FLAT STYLE"
to worldwide acclaim in 1929.
background. The subject matter was usually that of buffalo hunting, domestic scenes and ceremonial dances. thinking about it, as a part of everyday life." artists and teachers at the Studio, the University of Oklahoma, and Bacone College." grass or vegetation, which would also include an abstract sun, water birds, clouds, geometric designs or symbols. His favorite subject matter, particularly for murals, was scenes of the great buffalo hunt. Switzerland, lecturing on American Indian art. of painting and preserving the "images of their people," reflecting the public and social significance of their time. national recognition as producing highly talented and successful artists. 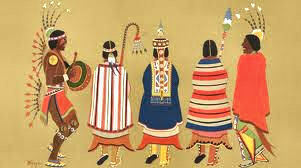 Reno, D. Contemporary Native American Artists. 1995. Schaaf, G. American Indian Jewelry I: 1200 Artist Biographies. 2003.